The craft was launched successfully toward the Moon, but two days after launch a faulty oxygen tank exploded, and the Service Module became damaged, causing a loss of oxygen and electrical power. There was a very large chance that the astronauts would die before they could return to Earth. They were very short of oxygen. Oxygen is not just used to breathe; on the Apollo spacecraft it was used in a device called a Fuel cell to generate electricity. So they conserved their remaining air by turning off almost all their electrical equipment, including heaters. It became very cold in the spacecraft. Apollo blasted off on the 11th April 1970 at 19:13 UTC from Cape Canaveral and went into temporary low Earth orbit. Two hours later they fired the rocket motor again to go towards the Moon. They wanted to land at Fra Mauro. Despite the hardships, the crew made it back to Earth. 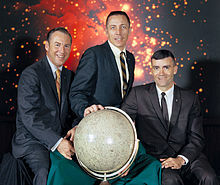 Though the crew did not land on the Moon, the flight became very well known. This page was last changed on 6 April 2019, at 08:55.